Joe Louis Arena Decommissioning – Testing Engineers & Consultants, inc.
TEC was retained to perform a Phase I ESA and a pre-demolition hazardous materials survey of the legendary Joe Louis Arena (JLA) in Detroit. 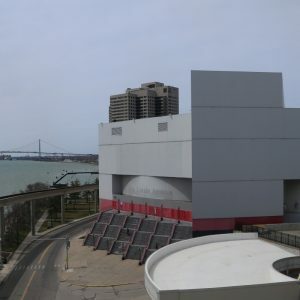 Built in 1979 for $57 million, the 20,000+ seat JLA sits on five riverfront acres and was the home of the Detroit Red Wings, numerous concerts, and other events until 2017, when the new Little Caesars Arena opened. Residential, retail, and perhaps a hotel are among the potential uses being considered for the site. TEC is providing environmental consulting services including an ASTM E1527-compliant, Phase I Environmental Site Assessment (ESA), asbestos and other hazardous materials surveys. A Phase II ESA, generation of bidding specifications, contractor coordination, hazardous material removal oversight, and clearance sampling are also being provided as part of TEC’s scope. To assist with obtaining brownfield funding for the project, TEC prepared an Act 381 Work Plan. The bitter-sweet demolition of the JLA is slated for 2019.